New construction is rapidly increasing on the north and south ends of Boca Grande as the trend for luxury homes continues to grow. According to My Florida Regional MLS, the principal tracker of sales throughout the state, the sales statistics for the Englewood Area Board of Realtors – including the Lee County portion of Boca Grande – are off the charts. In 2015, there were 78 sales of million-dollar-plus homes, with 96 more on the market for 2016. The average sale price of $2.9 million was 94 percent of the asking price, and the homes were on the market for an average of six months. Boca Grande Broker/Realtor Bob Melvin has worked in real estate for the past 30 years and has owned Gulf Coast International Properties since 1999. Melvin has been named the top-performing real estate professional in the area market for 2015. Out of 52 listed properties in the area in 2015, he sold 40 to create a total sales volume of more than $84,000,000 in Boca Grande and Cape Haze. In 2014 he had 29 properties listed, and of those he sold 24. Melvin said he has seen the demographics of the clients change over the past several years. provides everything they need, from fast internet connections to top-notch emergency service personnel to a very accessible health clinic. There are not many places that offer everything we have along with the peace of mind of knowing that your family is in a safe environment,” Melvin said. Melvin has been a Luxury Real Estate “Billionaires Club Member” since 2008. Island Realtor Candy Brooks said the market is “super hot” right now. “The last property I listed sold before it was entered in the MLS system,” Brooks said. Boca Grande Realtor Kevin Hyde with Parsley Baldwin Realty has ten newly listed properties for sale on the island, as posted in his newsletter. These properties range in price from $624,000 to $9,795,000. 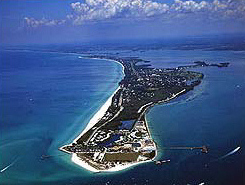 He has seven off-island listings ranging in price from $179,900 to $2,400,000. Carol Stewart, Broker/Associate for Michael Saunders & Company on the island, said sales are very strong right now. “We have seen a lot of positive activity in my neighborhood south of the village, including Golden Beach. There are a number of buyers waiting for specific types of properties like North Village in Boca Bay or in the historical district. Rental bookings are well into July this year, with a waitlist for season next winter. We have definitely been discovered,” Stewart said. Esther Maisch, Real Estate Agent for Paradise Cove and property rental specialist in the area for nearly 20 years, said she is seeing more and more people who are currently snowbirds choosing to give up their rentals and purchase a place to live permanently in the area. “Many people are just a few years away from retirement,and they feel that now is the right time to buy,” Maisch said. Maisch added that she is also seeing more younger people looking to rent in the area. “More and more people are discovering this island, and I am constantly seeing a strong interest from the European market,” Maisch said.